Hey all! I’ve been playing guitar for about 15 years now and am finally at the “I’m too frustrated with my skills … its time to really devote time to practicing more” mode. I’ve got a demanding full time job and my biggest deficiency is picking, so I thought this would be the best place to spend my time. I posted in a right handed players who are left hand dominant thread and I’ll repeat some of that here. I am struggling with whether my issues are mental, physical, or just down to technique. Issues: I have never been able to palm mute well, can’t pick beyond about 100-120 bpm 16th notes in a clean fashion, and generally am a bit shaky with the pick. I just flipped my guitar over yesterday to see how my left hand could pick and while not the exact same as my right, it feels close… I’m trying to get serious in solving this issue. What I do see working well when it comes to speed: I will say that 3nps licks come WAY easier than 4nps or anything beyond that with my right hand. I need to sit down and write down more stats I’d imagine for this community to be helpful, so let me know what you think. Interests include anything 80s hair metal a la VH, RATT, etc. Seems like a great community here, excited to be along for the ride! Not sure what of our stuff you’ve watched so far, but first thing I’d do is check out the Picklanting Primer, our intro technique tutorial, identifying your current technique, and experimenting with various grips / motions / picking strategies. We’re continuing to add new material to the Primer; let us know if there’s anything we can better address / clarify with this stuff! You could also try some forum searches for specific phrases e.g. “palm muting”, it’s possible that may turn up some relevant discussion! I can’t record a clip today but will aim to this week. I can say that my biggest issue is my hands tend to shake/bounce when I play fast. I also feel as if the pick snags on the upstroke. On the table tapping exercise, I top out around 240-250bpm 8th notes, 2 beats per note. After a few bars it gets off beat or sloppy. I could probably push harder but that was the upper limit doing it cleanly. Hoping this indicates it’s a matter of poor form than a physical limitation? I started with the intro stuff up to the pickslanting primer. I believe I’m more of a DWPS player, always had some slant to the pick, and it looks to “escape” as far as I can tell looking at my hand while playing. I’ve messed with some different hand placements and haven’t had enough time to experiment. I’ll say I used to struggle with low E alt picking and if I move my hand slightly off the bridge as an anchor it’s much easier. No way to palm mute that way though. For the video I assume it’s easiest to just film 16th notes, open notes on a given string to rule out hand synchronization? Great Yeah if you can move your hand roughly twice as fast as you can pick cleanly, does sound like it’s most likely not a physical limitation. No rush, fine to take a couple weeks for this. Once you’re comfortable with the “goals” described there, you can try posting a video for #technique-critique. Short and specific is best, per this page. (Note also other suggestions e.g. including regular speed and slow-mo, using a down the strings angle, and including specific questions in the post itself.) And yes I think good to aim for the simplest example to help isolate a problem / question! So Brendan, I was rethinking the exercise and might have done it wrong. Originally I did it with the palm facing down so the knuckles of most fingers are hitting the table. If I do it with my hand vertical (like on the guitar) and my pinky knuckle is tapping, after a few bars of 220bpm I just get shaky and a bit tight. The beats become off-beat, they may accidentally double up or skip a beat if that makes sense. Very similar to what I experience on guitar… thoughts? Hmm not sure, I think I see what you’re saying, maybe @Troy or others can chime in with further thoughts. I think either way, ~220 or even say 200 bpm is still so much higher than the speed you initially mentioned (100-120) that it’s a good indication of lots of room for improvement given more efficient / consistent picking motion. Worth trying several different motions and seeing how they feel. This post gives a good description of the process of experimenting with a new technique and trying to get it to “click” at realistic speeds, even if sloppy / inconsistent, to get a better sense what it feels like when it’s working. This “realistic speed but sloppy” phase is a critical stage of the motor learning process. It means that you’re zeroing in on what it feels like to actually do the motion correctly, which is the most important first step you can take. The accuracy of the actual notes doesn’t matter as much at this point. What matters is that you can feel the “click” of the motion kicking into high gear, that you have some kind of visual confirmation of the motion being correct, and that you can hit at least some of the notes, some of the time, so that you can verify that they sound good and realistic. A good-sounding pick attack is one piece of evidence that you’re doing the motion right, and the motion is really what we’re trying to evaluate here. These three criteria are how you know you’re getting somewhere with a new motion. Cheers Brendan. I’ll read the thread you mentioned and give it a few days and report back! This is correct. It’s a test of wrist flexion-extension since most people are already good at it from numerous everyday activities throughout their lives. The idea it to demonstrate that you probably don’t lack “genetics” for speed, and there are movements you can already make right now at speeds which we typically think of as only reachable by the fastest of the fast. 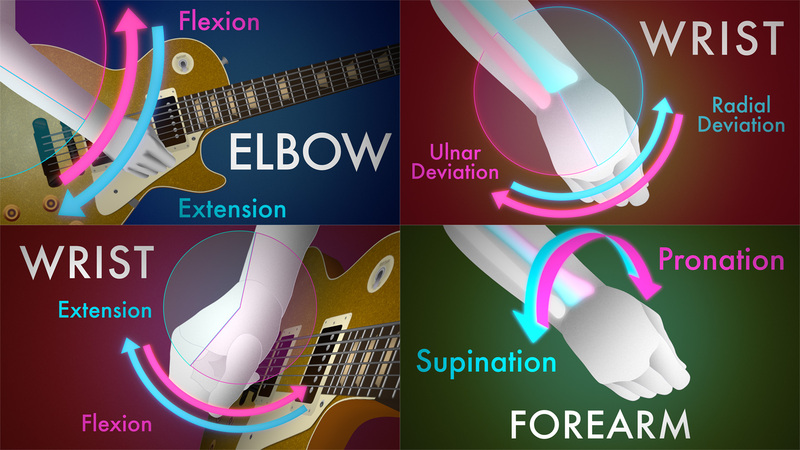 This is wrist deviation and I can’t do it as fast as I can do flexion-extension either. 210bpm is about what can I do in a musically useful way while holding an actual pick, i.e. where it sounds good and is usable across a range of things. And I’m not going to be playing at that speed for long stretches of time. But I can play a bar or two at that tempo of sixteenths notes and make it sound good. I am completely fine with this. Very rarely do players go much faster than this. In fact, the number of players with real alternate picking independence at 160bpm, beyond things that are simply scales or patterns, is a pretty small group of players. Not many players out there can rip out a Pat Martino or Steve Morse line with pure alternate and be clean and sound good, even though you don’t need superior speed genetics to play at those tempos. You just need to be able to do the hand motions. This medium-fast range of tempos is the fat part of the bell curve where tons of music gets made, and we think everyone has the physical ability to land at least somewhere in here. Thanks Troy! The feedback so far has been encouraging. I’ve been trying to adjust my grip and forearm orientation using examples from the pickslant primer and everything feels very uncomfortable outside of my normal posture. As far as I can tell from my playing position, my posture is similar to Andy Wood. Any other type of adjustment feels tight and unnatural. I’ll have to work on recording a video to see if you’re seeing something I am not. There’s no need to do anything different from what Andy does! Andy’s orientation is fine and as you can see works pretty well. The later sections of the Pickslanting Primer with closeup shots of string switching were never intended as an exact blueprint for the actual picking motions you should use — only visual examples of what the pick should look like as it’s switching strings. We cover Andy’s style of positioning here, which is roughly similar to what John McLaughlin uses. These are both wrist players. We also spend a good 15-20 minutes on blends of wrist and forearm more similar to what I use in the later examples. Any of these will work. In the coming months we’ll be adding much more itemized / bite-sized instructions for all these motions. At the moment they are all massed together into this two-hour lesson, so apologies from us. We’re hustling to get things more streamlined.